In a previous article I made the case that China does not hold the position of power over the U.S. economy that many have come to believe. A portion of my argument was focused on disproving baseless claims that China is selling off its U.S. Treasury holdings. As I discussed, China has actually been stockpiling U.S. Treasury securities over the past several years. This fear-mongering over the fate of the U.S. dollar and dollar-denominated assets has been orchestrated by a barrage of charlatans. As a part of their “doomsday” scenario, they claim that hyperinflation in the U.S. is imminent. Truth be told, as long as the petrodollar remains intact, hyperinflation in the U.S. is not possible. This is a statement of fact. Anyone who claims otherwise has absolutely no idea what they are talking about. Rather than China, Saudi Arabia ultimately fuels the U.S. economy. Let’s take a look how the Saudi’s have been positioned as the venerable engine of the U.S. economy. In 1971, the final phase of the gold standard was eliminated after Washington refused to honor France’s demand for payment in gold in exchange for dollars. Prior to that, the U.S. dollar was pegged to the price of gold. Moreover, virtually all other currencies were pegged to the U.S. dollar. Thus, once the U.S. severed the gold standard a global fiat currency system was established, as no currency was backed by gold. Shortly thereafter in a deal brokered by Henry Kissinger under the Nixon administration, the Saudis agreed to settle all crude oil sales with U.S. dollars. Due to the clout held by the Saudis, the rest of OPEC followed suit. This relationship between the dollar and oil is often referred to as the petrodollar. The petrodollar serves as America’s most valuable economic lever. It empowers the U.S. economy by means of extortion because one must have dollars in order to buy and sell commodities on the major international exchanges, from oil, gas, gold and steel, to apples, oranges, coffee and cattle. This is the main reason why the U.S. dollar serves as the world’s reserve currency. Based on its relationship with oil and other commodities, one could argue that the dollar is not exactly a fiat currency since it is backed by the demand for raw materials. Raw materials are in limited quantity. They are also in high demand because they are required for economic growth. They are required for basic sustenance. Although the petrodollar remains the primary centerpiece controlling global macroeconomics and geopolitical strategy, it’s never mentioned in the U.S. media. In fact, you will be blacklisted if you publicly discuss the significance of the petrodollar. This is precisely what happened to me. American consumers serve as the superficial driving force of the U.S. economy, but there are a few significant enablers worthy of mention. Certainly, China enhances the economic power of American consumers by providing inexpensive imports. As I discussed in a previous article, China is able to gain numerous competitive advantages over domestic manufacturers by exploiting differences in trade policy with the United States. But this is not the primary force that fuels American consumers. Inherently one might assume that a strong consumer would be the by-product of higher living standards or higher personal incomes. Enigmatically, the powerful consumer demand seen in the U.S. has not come from a commensurate increase in living standards or personal incomes. On the contrary, as domestic demand has soared over the past three decades, U.S. living standards have trended downward. So what has been the source of this demand? The ultimate source of fuel for the American consumer comes from the Federal Reserve Bank in the form of credit. Instead of spending more on consumer items as incomes rise, most Americans use credit in order to improve their living standards. As you can imagine, this is not a sustainable path to prosperity. The majority of the credit created by the Federal Reserve comes by way of fractional reserve lending. Some liken this mechanism to creating money out of thin air. But this money is backed by the petrodollar trade. That is, the demand for dollars increases every time oil is bought. Thus, when the Federal Reserve wants to print excessive amounts of dollars, the global demand created for dollars through the purchase of oil and other commodities will diminish the inflationary effect that would have been otherwise created within the United States. While other nations use fractional reserve lending, they face the possibility of hyperinflation at some point because their currency is backed by nothing other than the underlying economy and strength of the government. Because the United States has been transformed into a consumption-based economy, it must create asset bubbles during periods of weak domestic demand. The Federal Reserve’s ability to create these asset bubbles is enhanced by the petrodollar. Thus, the petrodollar enables the Federal Reserve to form asset bubbles, while exporting inflation throughout the globe. As discussed in America’s Financial Apocalypse, petrodollar-based inflation is the manner by which the United States taxes the globe. Without the petrodollar the U.S. economy would face very dire consequences. With it, the U.S. can print its way out of messes and force the rest of the world to subsidize its mistakes and finance its asset bubbles via exporting inflation. Now that you understand how the dollar is linked to oil and other commodities, hopefully you can appreciate that hyperinflation in the U.S. is not possible as long as the petrodollar exists. For instance, hyperinflation would render the dollar as worthless. As a result, no one on earth would be able to afford oil or other commodities. In a previous article where I discussed China’s role in the U.S. economy, I pointed out that China remains as the largest foreign holder of U.S. Treasury securities because this keeps U.S. interest rates low. And low interest rates means consumers can buy more imports from China. Unlike China’s export-based economy which depends on low interest rates in the U.S., oil-rich nations could care less about keeping rates low in the U.S. because inflation (which increases when rates are low) causes the price of oil to rise. Thus, Middle Eastern nations spend much more of their petrodollar surplus buying up hard assets such as hotels, restaurants, resorts and other businesses as opposed to investing in U.S. Treasury securities. But of course they do own a decent amount of U.S. Treasuries due to their trade surplus with the United States, and as a symbol of loyalty to the petrodollar arrangement. How did the Saudis benefit from agreeing to accept only dollar payments for oil? In return for establishing the petrodollar, the Saudi Royal Family was granted unconditional military support by the U.S. government against all uprisings, both foreign and domestic. As well, they were guaranteed protection against Israel. Finally, the Saudis were assured they could govern their people in any way they chose without the threat of economic sanctions from the United States. This is specifically why Saudi Arabia has not faced sanctions despite its long history of religious and human rights violations. The one flaw in the petrodollar trade is that despite the fact that a good deal of inflation is exported out of the U.S., eventually some of it will return like a boomerang in a variety of ways. But as far as Washington is concerned, the benefits outweigh the risks because excessive inflation can serve as a means by which to more easily pay off its mounting federal debt. In this way, Washington can have its cake and eat it too because petrodollar economics guarantees that the U.S. will never face a hyperinflation scenario. The petrodollar always creates a win-win situation for the United States. Meanwhile, other nations get shafted. Despite the obvious importance of the petrodollar, countless individuals continue to warn of hyperinflation in the U.S. Their motive is to get their audience to buy gold so as to raise the price so they can sell it before it collapses. Others don’t care where the price of gold goes so long as they convince people to buy it from them as they slice off 3 or 4 percent of the total in fees. If you want know whether it’s a good time to buy a house, the last person you should ask is a real estate agent. The same applies to gold. Gold dealers are the absolute worst source of information and insight on gold because everything is spun to manipulate their already biased and largely unsophisticated audience. Even if hyperinflation were to hit the U.S., gold isn’t going to help you one bit. Your best investment would be food, water, guns and bullets. Iran understands the true significance of the petrodollar, which is why it has been selling its oil for other currencies. Iran’s attempt to disrupt or weaken the petrodollar arrangement serves as the primary reason why Washington initiated economic sanctions against this peaceful nation. The illegal sanctions imposed on Iran by the Zionist-controlled international community have forced Iran to barter its crude oil for agricultural goods. Iraq, once under the leadership of Saddam Hussein began selling its oil for euros in 2000. Soon after, Washington created lies about WMDs in order to justify invading Iraq. I think you get the point. Although other nations such as India, China and Germany are now accepting currencies other than the dollar in exchange for their oil, this should not be interpreted as a serious threat to the petrodollar. OPEC dictates the fate of the petrodollar, and Saudi Arabia controls OPEC. However, unified OPEC opposition to the petrodollar could pose as a very challenging dilemma. This has obvious implications for Iran and other OPEC members that are exploring alternative forms of payment other than the dollar. Similar to other nations considered as “hostile” and “dangerous” by Washington and other Zionist-run establishments throughout the globe, I would imagine that Iran has no intention of allowing itself to go along with globalization mandates. My guess is that Iran’s leaders understand that the real objective of this criminal conspiracy is to abolish sovereignty and transform all complicit nations into slaves of the international bankers, as has already happened to much of the globe. Iran, North Korea and Venezuela refuse to take part in the globalization agenda engineered by the international bankers. For this, they have been put on a “hit list” by the terrorists in Washington and their foreign associates, as instructed by the Banking Cartel. This is the reality you never hear about. But it is a critical point worth revisiting whenever you come across negative press about these nations. It is indeed ironic that the manipulation of the global economic system by a Zionist crime syndicate requires the indirect participation of an Islamic nation. This relationship should tell you where the Saudi Royal Family stands when it comes to America’s Zionist agendas. Muslims of the world, especially those residing in the Middle East should take note of the relevance of the petrodollar. 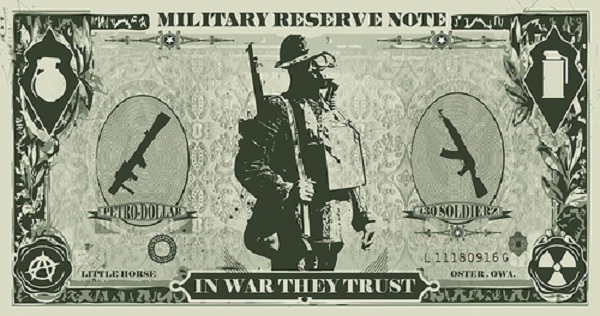 Not only does it function as the economic engine of the United States and the Jewish Banking Cartel, it also serves as the enabler of wars against Islamic nations. Thus, as several key nations continue to explore non-dollar payments for oil transactions, Islamic leaders have a far greater bargaining tool to be used to combat Zionist terrorism and international extortion at the hands of the Banking Cartel. This entry was posted in Gulf of Mexico Oil Spill Blog and tagged Petrodollar, Saudi, US, Zionists. Bookmark the permalink.